Yesterday my google search for dinner was exactly this: “soy saucy and tangy”. I wasn’t sure what I wanted, but something light, Asian, soy saucy, and tangy! 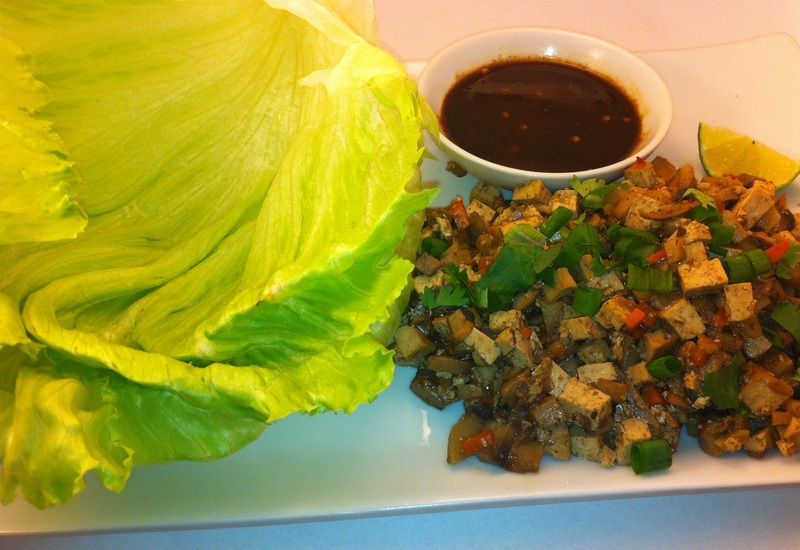 This recipe in the search inspired my recipe for Chinese five spice tofu lettuce wraps. I especially loved the sauce recipe included as many recipes out there don’t add a sauce to lettuce wraps, something that I think is essential! Mix all the ingredients together and shake well (I used a mason jar). Get all your ingredients prepped (onions, garlic, ginger, mushrooms, tofu, water chestnuts, carrots, green onions, cilantro, lettuce…). Heat 1 tablespoon sesame oil in a medium stock pan and add onions, garlic and ginger and cook until the onion starts to get translucent. Add the mushrooms and cook until the mushrooms are sauteed (they will shrink a lot). Add the tofu, water chestnuts, pre-boiled carrots, sesame oil, soy sauce, maggi, hoisin sauce, sambal oelek, sesame oil, brown sugar, and Chinese five spice. Salt if it needs it. Cook for a 5-10 minutes to get the flavors to meld. Serve with big lettuce leaves and the sauce. It would also be really good with a little bean thread deep fried so that it is poofy, but I forgot this step! We were wondering how the tofu gets so crispy….hmm baked tofu. I was craving some gluten free lettuce wraps. This looks yummy and easily gluten-free-able.